The nanchon or division of Haitian Vodou known as Congo breaches across the rites of Rada and Petro, especially is this the case of Simbi Andezo, the lwa that is seen as having one foot in the sweet waters and the other in the salty waters. Andezo is like all Simbi lwa enigmatic and mysterious, as revealed in many of his songs, which speaks of how his votary seeks to know him, but he hides from getting known. The nanchon Congo is a complex fanmi where their complexity is well demonstrated amidst the Simbi lwa. In Congo these spirits were called basimbi and designated the spirits living around ponds, rivers and fresh waters. They were at times considered to be a class of spirit composed of highly developed ancestral spirits. The Simbi ranges from the balanced and benevolent, as we find in Simbi Andezo to forms like Simbi Macaya, the lwa that was adopted as patron for the Bizango cult formed by Makandal during the rebellion in 1757. Simbi Macaya is seen as violent and dangerous and it is said that slave masters were sacrificed to him in the time of Makandal. 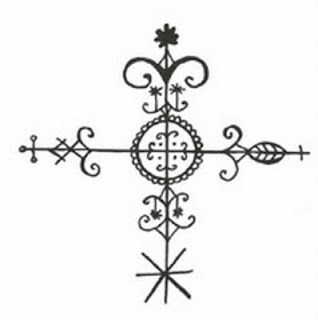 The Congo petro rites are said to be bakongo in origin, and some say that it is the bakongo way that informed Petro rituals as well as many secret societies and more obscure rites, such as Zandor. The patron for the Zandor rites is Ti Jean Zandor and Erzulie Zandor, but it also count in its fold, Krabinay, Marinette and Simbi Yan-Kita. The Kita lwa being a sub division within the Congo nanchon together with Boumba, Caplau, Kanga and Mandange. According to Metraux the Congo division is also parted into Congo du bord de la mer, “Seashore congos” and Congo savane, ‘wild congos”. It is the latter that forms the influence into the Zandor rites and take of ferocious and nefarious qualities where they impart superior knowledge of herbalism, malefica and wanga. The seashore congos are said to be of fair skin and possess long black hair and be of a superior intellect and possess better manners than the wild or interior congospirits. This form suggest a connection with La Siren and Agwe and therefore with the potency of prophecy, dreams and inspiration. Interestingly it seems that this class of lwa was already known in Haiti prior to the population from Africa as the Tayino Indians knew a spirit called Zimi, said to have a copper red hue and long black hair, living around springs and fresh waters. Usually these spirits are called Ti-Simbi. Simbi Andezo is the Simbi that, like Leghba and Danballah possesses the perspective that sees two sides at the same time. Like Leghba he opens the crossroad for entrance into the rite, but Andezo opens the crossroad between the rites themselves. He possess the power to make the sweet into vinegar and the sour into honey. 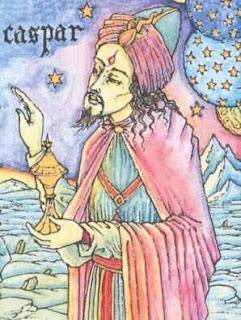 He is a Simbi of inspiration and secrecy, and albeit shy and difficult to know, as all Simbis, he possess a unique Janus qualities between the Rada and Petro rites where he brings a form of equilibrium between the sides. The Catholic imagery used to display Simbi varies from Moses to St. Charles Boremeo, but quite typical the Three Magi Kings are used to represent Simbi and thus the 6th of January becomes an important day for the celebration of this mystery. Simbi is served with the colours white and greed, Andezo for instance is served with white, red and green. On his vévé we give a plate of white china, where a glass of kleren and a cup of coffee are presented along with candles. We give a twist of lemon in his coffee and kleren, as the sitwon tree (lemon tree) is sacred to him. Simbi Andezo Sa ki fe yo pa vle we mwen yo poko konnen mwen. Se pou m mache la nwit O Simbi Andezo!